I’m home alone right now. The day started out nice but has turned from a sunny chilly day to a very cold, rainy, windy afternoon! Last night my daughter Kristen spent the night and we had a great time. She actually came out our way in time for lunch and then worked at the house the rest of the afternoon. It’s always great to spend time with her and even though she lives nearby, it’s difficult for us to spend as much time together as we would like. We both love Pho (Vietnamese noodle soup) and Bob doesn’t so it’s a special treat when just the two of us are together and we can eat what we want. We didn’t do anything exciting but it was fun to get caught up on TV that we both misssed over the holidays. I’ve been really struggling again with my sleep and have been napping almost every afternoon. It’s one of those things that’s hard to explain. I feel well but then all of the sudden I become exhausted and need to rest. On Monday I had my NorCal/NorNevada Alzheimer’s Board of Directors meeting, which I knew I couldn’t handle in person and had planned on dialing in. Unfortunately I fell asleep that afternoon and missed the first few minutes! That’s how tired I was. Thank goodness everyone totally understood and was just glad I made it to the call and could participate. This weekend was also wonderful down in San Luis Obispo with Bob. The weather was amazing and we stayed in Avila Beach right across from the ocean. I flew down all by myself!! I am VERY familiar with SFO after all my years of travel so Bob and I knew I could handle it on my own. The only bad news was the flight was delayed over four hours. I made the most of it and did several miles of walking and read an entire magazine cover to cover. No need to get upset about something you can’t control. Life’s too short.....especially my life! 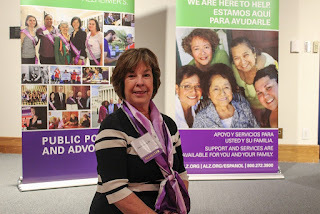 I might have mentioned in an earlier blog that we were going to an event in Sacramento so that I could speak on a panel discussion around the impact of Alzheimer’s on women. That trip turned out to be fabulous! Good advocacy discussions/meetings during the day at the State Capital and then a panel discussion moderated by Liz Hernandez (formerly from Access Hollywood) in the evening. I was interviewed prior to the panel and as it turns out that article was posted Nationally on Kaiser News and on the front page of many newspapers! Including the Sacramento Bee just a few days ago. My main message was we need to start our own movement, to follow the #metoo phenomenon. We need to raise our hands and tell the world #IhaveAlz and that there’s no shame and no reason not to seek help and get support. So as you can see it’s been a busy month, but the best news is I am done with my cold and cough and grateful to be back out spreading my message and raising awareness. My husband is amazing and continues to move his schedule around so that we can be together as often as possible. My friends and family have visited me and stayed with me so that I wouldn’t have to be alone for too long. 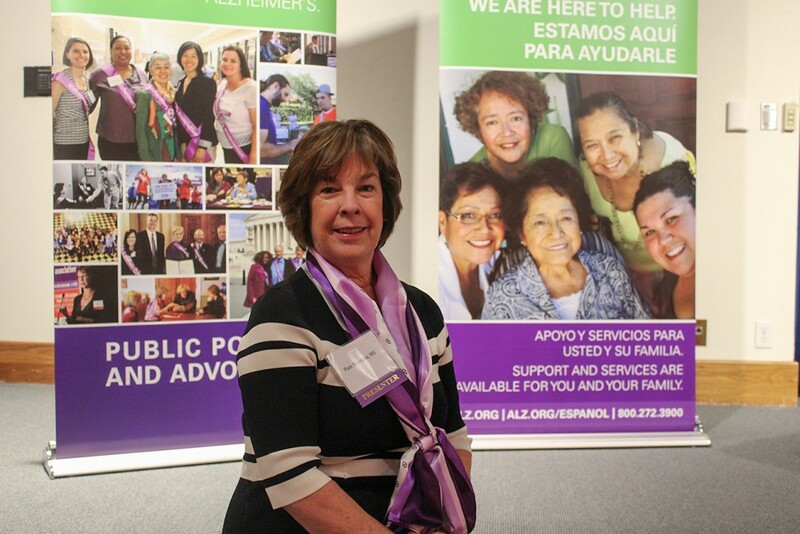 The Alzheimer’s Association continues to impress me with their amazing staff and wonderful events. I’m not really sure where I would be without their support. But a little over a year ago, she started to forget appointments and details from meetings, and began to depend heavily on her secretary. Then she started making mistCakes. Ultimately, one got her fired. Once the event started, panelist Kaci Fairchild, a psychologist and professor at Stanford University, told the audience of about 50 about the importance of exercise — for the body and the brain. She also urged everyone to become familiar with the10 early warning signs of Alzheimer’s, which include poor judgment, personality changes and withdrawal from social activities. It's 2018. How did that happen? I'm still struggling with that date. I'm still writing 2017 in my journal, but when I look at it I know that it doesn't seem right. The days are flying past. Christmas is a distant memory although we still have some decorations to put away. I've been sick for over a week. I'm not exactly sure what I have but its been pretty bad. Headache, coughing, congestion, lack of appetite. Basically I've been no fun and feeling crappy. I've had to push myself to get out of bed. I was able to leave the house twice since Sunday but it took a lot out of me. I feel bad for Bob. I'm no fun and haven't been eating much either. Today we have our grandsons Ryan and Michael here and we went to a movie. It was wonderful -- we saw The Greatest Showman with Hugh Jackman. I did pretty well but needed a nap afterwards! Jeez, I sound like an old lady but I guess this is what being sick is like. I don't get sick often and I'm not used to being lazy, but all I can do right now is rest. January - vacation in Sedona with Karen & Monica! My first time there and we had a blast. February - Speaker at 'Part The Cloud' in Menlo Park. Met Maria Shriver! May - Hamilton in San Francisco with Bob- Sat in the same row as Steph Curry! December - Christmas at our house with family and our new grand puppy Celly! I'm sure I missed a few things but this will be helpful to me when I look back and read this later. Some of the events are fresh in my mind, some of the details are fuzzy, but I am thankful for the opportunities that have been presented to me. Thankful for all the amazing people I have met. Thankful I can help others by sharing my stories, my struggles, my fears. I'm sure this year will be busy too. That's ok, I like making an impact and doing what I can to help. Next week Bob and I will be in Sacramento on Monday to participate on a panel for the California Legislative Caucus. The year is starting off well. Now all I need to do is get healthy and quit coughing! Happy New Year everyone. I hope your holidays were wonderful and that you were with the ones you love. Let's make 2018 the best year ever! !